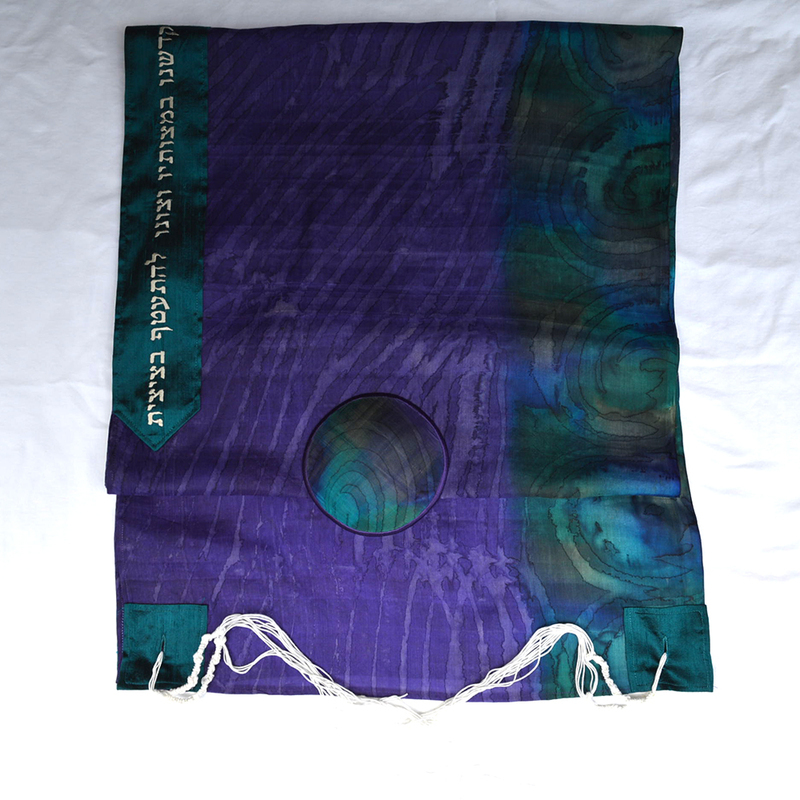 I made my first tallit out of an embroidered shawl. I shook when I put it on for the first time. I had grown up in a world in which only men wore prayer shawls. A part of me felt as if I were transgressing. That was eighteen years ago. And I’ve been making kippot and tallitot ever since. I resisted turning my hobby into any kind of business. My practice was, for years, to make my work into gifts for friends and colleagues. But after repeated requests to sell my work, I eventually created Not My Brother’s Kippah and put my things up on Etsy. I began to meet people I would otherwise never have known. I learned about their lives. 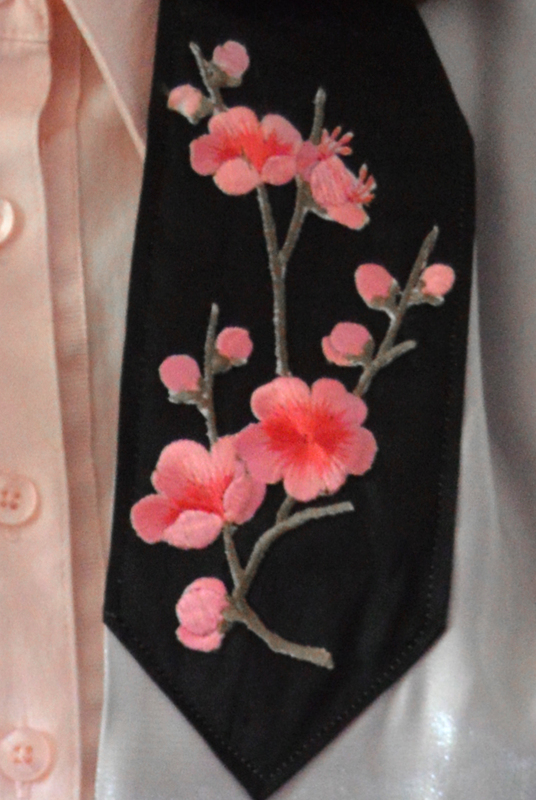 I found that what I designed and cut and sewed was a wholly new way to bless – even to heal. About an hour later, she wrote back to tell me that she did know, after all. She had become, she said, her mother’s courage during her “early departure.” The verse she chose brought her mother back to her again: Al tirah ki imcha ani. Fear not, for I am with you (Isaiah 41:10). 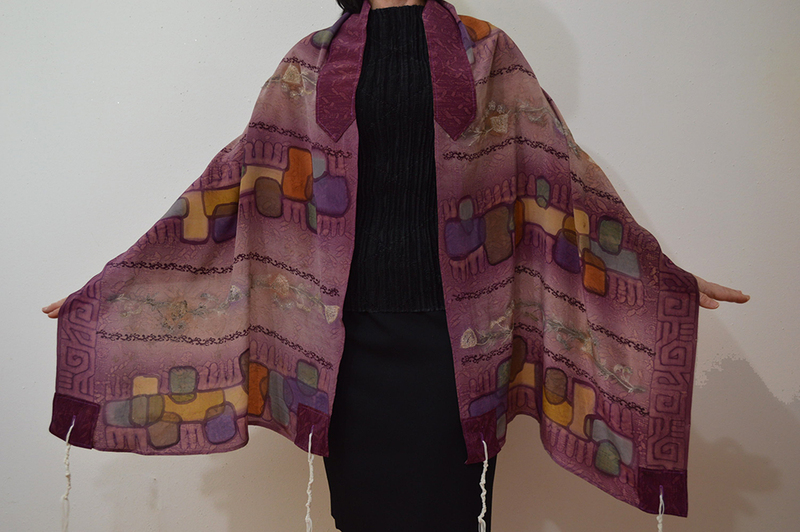 There was a second client who wanted a tallit that would speak both to her Chinese and her Jewish heritage. I learned a life story in our correspondence – how her parents had escaped from danger, how she had learned to make her life in America, how she had, over three decades, framed every aspect of her Jewishness in the tikkun olam work she embraced. And then there was a young Jewish-Vietnamese American woman who contacted me in December of 2017. We engaged in months of consulting and negotiation about colors, patterns, and texts. We needed fabric with a lotus pattern but had to be sure to avoid anything white – especially touching her head. White, she told me, is the color of death in Vietnamese culture. So though her kippah was made of fabric that included a creamy white, I lined it with lilac silk. On her atarah, she wanted Genesis 18:27: “Here I venture to speak to my Lord, who am but dust and ashes” (Genesis 18:27). She knew the tale of Rabbi Simcha Bunem of Pershyscha, who carried two slips of paper in each of his pockets, one of which read: “bishvili nivra ha’olam” (for my sake the world was created) the other v’anokhi afar v’efer” (I am but dust and ashes). At her suggestion, I embroidered the two phrases on the inside corners of her tallit. To be clothed in humility and surety in perfect balance – that was her kavannah. Once she wrote, “I’m going to pass this down to my great-grandchild with all the blessings you’ve prayed OVER it, that I’ll pray IN it.” I finished it just before her thirtieth birthday. She celebrated by leyning Pinchas in shul that weekend. Recently, I decided to heal as I created in a whole new way; I began making tallitot out of gently used saris. I want to repurpose, reuse, renew. Each sari has its own story. 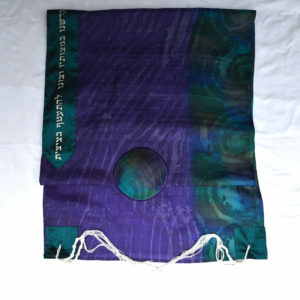 As each becomes a tallit, it binds traditions and cultures together in a wholly new way. And why not celebrate diverse worlds coming together? We could use more of that in our time. Connections emerge, take life, become unexpected gifts. This past month I have corresponded and talked with the mother of a boy whose bar mitzvah is a year away; I’ll be talking both with the young man and his rabbi at some point. Just this past week or so, after he bought four kippot of mine, I began corresponding with a young man in Munich, whose story becomes increasingly tender and beautiful with each email. My life is inordinately busy with classes to teach, administrative work to accomplish, research to complete. I never have the time I would really like to have to sew as much as I long to do. And I usually think of my teaching and research and writing as the most important work I do to nourish the tribe. Maybe it is. But I have also learned that the renewal of all we know and the discovery of all we have yet to realize about Jews and Jewish life – these are things, it turns out, that can be found in cutting, stitching, and blessing. May the work of all our hands serve such aims. Note: This post is in honor of my son, Erik Henning Thiede. He had the idea for using the saris to make tallitot so that I could become a more environmentally aware fabric artist.